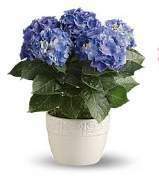 Hydrangeas are the beautiful, large bushes covered with large blooms of blue, white, or pink flowers. The color of the bloom changes to blue in acidic soil and to pink in soil with more lime. It is even possible to have different color blooms on the same plant. They are easy to grow and resistant to most pests and diseases. 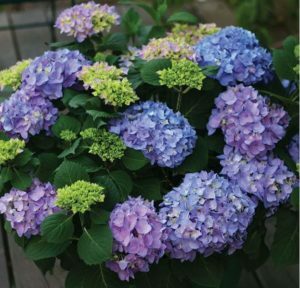 Grow hydrangeas in full sun or partial shade. Since they do not like extremely hot conditions, it is better to grow plants in partial shade or at least afternoon shade. It is extremely important that the soil is rich and moist with good drainage. At least once a week, deep water the plants especially in dry weather and apply fertilizer in spring and summer. In the Yucatan since they grow year-round, winter fertilizer is appreciated. Pruning should be done once blooming has slowed because blooms are produced on new growth. You may deadhead spent blooms before August on long stems. After August, the spent blooms should be removed on very short stems since new buds are growing along the stem for the next explosion of blooms. They can be cut back to the ground and this will produce larger blooms. Lesser pruning will produce smaller blooms on sturdier stems. Hydrangeas are perfect for large pots. Just be sure they get enough water and keep them moist but with good drainage. Most varieties of Hydrangeas are moderately salt tolerant. 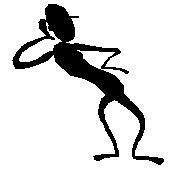 What’s New Around Akumal etc.